On June 22, Brenda Tracy will speak to the Nebraska football program about her experience being raped by a group of four men, including three college football players. In 1998, four players were present during Tracy’s assault, two of them Oregon State players under then-head coach Mike Riley. When Riley was still Oregon State’s head coach, he promised Tracy an opportunity to speak to his team and tell her story. After his move to Lincoln, Riley made sure Tracy was aware that his offer was still good (according to Steven M. Sipple of the Lincoln Journal-Star). She’ll tell them about the four college football players – two of them Beavers – who were present, and the drink she accepted without knowing what was in the cup. Tracy will try to find the words to explain what it felt like to grow sleepy, then lose consciousness, only to wake up being sexually assaulted by four men. She’ll talk about being terrified, unable to fight back, and how she pleaded with one of them to make it stop. The assault went on all night, and continued the next morning. Tracy eventually woke up on the floor of the apartment with crumbs, condom wrappers and garbage stuck to her naked body. “Those men treated me like garbage,” Tracy said. The stories of how Oregon State and law enforcement officials in Corvallis failed Tracy was described in gut-wrenching detail by Canzano. And it’s more than fair to question Riley about how he responded to those allegations. Tracy summarized how she felt about the inadequacy of Riley’s response. The story is hauntingly familiar to what happened in Waco with the assaults and alleged assaults surrounding the Baylor program (as outlined by Max Olsen of ESPN). It’s hauntingly familiar to how the investigation of sexual assault allegations against Florida State quarterback Jameis Winston were mis-handled by the Tallahassee Police Department and local prosecutors (as described by Patrick Redford of Deadspin). It’s hauntingly familiar to how law enforcement in State College failed to investigate or prosecute Jerry Sandusky as he was serially abusing children at Penn State (as detailed by Nate Schweber of the New York Times). Stories like that – failures like that, betrayals like that of both the victims and those who could be wrongly accused – are why I still have to say “alleged” assault so many times. Not because the assaults didn’t happen, necessarily, but because the desire to protect the program outweighed the pursuit of justice. Because time and time again for coaches, local law enforcement, and university administrators, the screams of the crowd on football Saturdays drowned out the screams of victims in dorm rooms and locker room showers. With Art Briles’ dismissal as head football coach at Baylor, much digital ink (like here and here and here) has been spilled about how we as a country have reached a turning point, about how we will get serious about investigating and prosecuting sexual assault allegations against football players. Maybe. Hopefully. But I’ve heard that before, read those think pieces before. 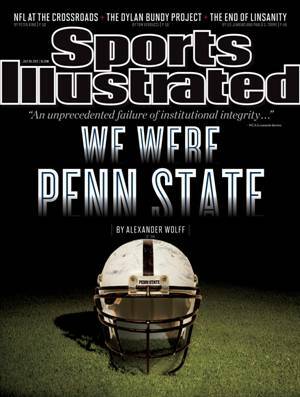 Remember this devastating “We Were Penn State” Sports Illustrated cover after the Sandusky scandal broke in 2011? Remember how we thought after that, something as insignificant as winning college football games would no longer take a back seat to protecting the vulnerable from being victimized by the powerful and influential? How after Sandusky those in positions of authority – coaches, local law enforcement, and university administrators – would never allow the status of The Program to interfere with the investigation and prosecution of crimes? Fast forward a little less than five years. Penn State’s sanctions have largely been wiped away. The Tallahassee police made sure we could never get to the bottom of Winston’s assault allegations. Baylor happened. And those are just the high-profile cases. So what will it take to change the culture of college football, to truly make sexual assault unacceptable, to make college football players and coaches who commit and abet those crimes truly accountable? Well, perhaps what it will take is someone inside the fraternity – like Riley, known and respected throughout the world of college football – to own his past failures and address the issue with his team and with his fanbase head-on. Riley has acknowledged that he’s changed how he looks at allegations of sexual assault since Tracy’s incident in 1998. In a 2014 interview with Canzano, Riley discussed how his thoughts about handling sexual assault allegations have changed through the years. “It’s so sad to me that it still haunts her. It’s scary what that means to a lady,” Riley said. “Maybe retribution would have helped that. I don’t know. I just reminded our team here recently about those things that will change their life and others in a blink of an eye. Still, Tracy’s feelings about Riley are understandable. Riley is making sure that Tracy gets the chance to tell her story to his players. He doesn’t have to do that. No charges against Riley’s players at Oregon State were ever filed (thanks, in large measure, to the failures of law enforcement to properly investigate the assault and preserve evidence). Tracy’s civil lawsuit against Oregon State – and Riley – is ongoing (according to Bryan Denson of The Oregonian). But Riley is keeping his word to Tracy anyway, and a new group of college students will hear first-hand the experience of a woman raped by a group of college football players. Nebraska’s football players are no different than other football players at big-time programs around the country – some wonderful kids, some selfish, many with an over-developed sense of entitlement coming from a life of being the best football player on a team and all the perks from an adoring community that status entails. Those players will hear a very human story of horror and trauma inflicted upon a woman when college football players – kids in exactly the same situation they are in – felt entitled to take what they wanted from her without her consent. And maybe, just maybe, those words will echo in their minds when an opportunity to take advantage of their privileged status arises for members of Riley’s football team. Over the years, Tracy has been able to make her peace with Riley, even though she has not yet been guaranteed an opportunity to meet with him on a one-on-one basis when she comes to Lincoln. And Riley’s explanation to Canzano as to why he agreed to let Tracy speak to his team gives some insight about what Riley hopes Tracy’s talk to his team achieves. “I think kids have to always understand it’s about choices,” Riley said. “The other basic thing to understand is how you treat people. It’s one more piece. I really appreciate Brenda reaching out, stepping out to do this. I think it will be a real-life thing. I think that’s what players need to know about. There’s people’s lives involved here and how it affects them. And, more importantly, Tracy described to Canzano her reasons for coming to Lincoln and describing her ordeal to Riley’s team.